The University of Delaware’s Kali Kniel has been awarded the 2015 International Association for Food Protection (IAFP) Elmer Marth Educator Award, which recognizes an outstanding educator who consistently serves their university in a teaching and research capacity for dedicated and exceptional contributions to the profession. Kniel, professor of animal and food sciences in the College of Agriculture and Natural Resources (CANR), is one of the youngest professors ever to win the award, which is the highest honor IAFP can bestow on a faculty member. Kniel was nominated for the award by Manan Sharma, a colleague at the U.S. Department of Agriculture (USDA) Agricultural Research Service and also an affiliated faculty member in the Department of Animal and Food Sciences. Kniel’s doctoral adviser, Susan Sumner of Virginia Polytechnic Institute and State University, received the award in 2000 and Kniel wrote a letter of support for her package then. “It is truly an honor to receive this prestigious award,” Kniel said. 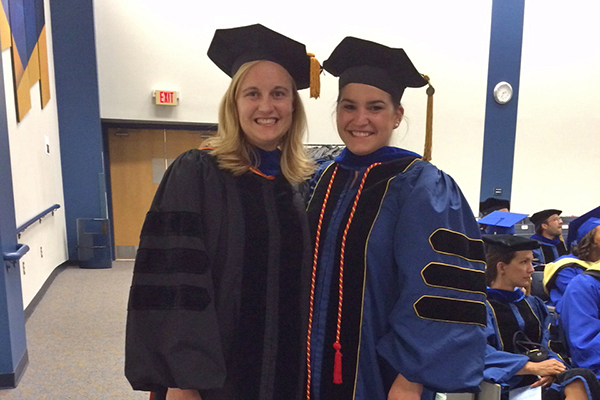 Kniel also was the 2015 recipient of the CANR Outstanding Teaching and Advising Award. “I am truly humbled by the two awards I have received for teaching, which is a huge passion of mine,” said Kniel. “It’s overwhelming and such an honor because we have such an amazing group of educators and professors in the college, people that I have learned a great deal from.” Sarah Markland, who recently received her doctorate from the Department of Animal and Food Sciences, was the 2015 recipient of the William J. Benton Graduate Student Award and had Kniel as an adviser and a teacher said she is not surprised by the honors presented, saying, “Dr. Kniel is the type of professor whose enthusiasm is so contagious that it enables her students to feel inspired and empowered. She genuinely wants all of her students to excel and tries to help guide each of her advisees down the career path for which they are most passionate about.” Markland said Kniel has been her mentor at UD since 2007 and “it is because of her I found something I am extremely passionate about as a food safety researcher. I would have never expected in a million years that I would have developed into the scientist I am today without her constant support and encouragement. I admire her as an educator, a mentor, a researcher and as a person, and I feel extremely fortunate to be able to study under her mentorship. I hope that I am someday able to become as successful she has become in her career as a food safety educator.” This article can also be viewed on UDaily.